Out of nowhere comes the high priced Day 6 Plotwatcher Pro HD Game Surveillance System, and it really is an interesting model. It separates itself from the pack by being different from the competition, but without sacrificing needed features. In fact they add a couple of good ones that might make you upgrade your current camera. 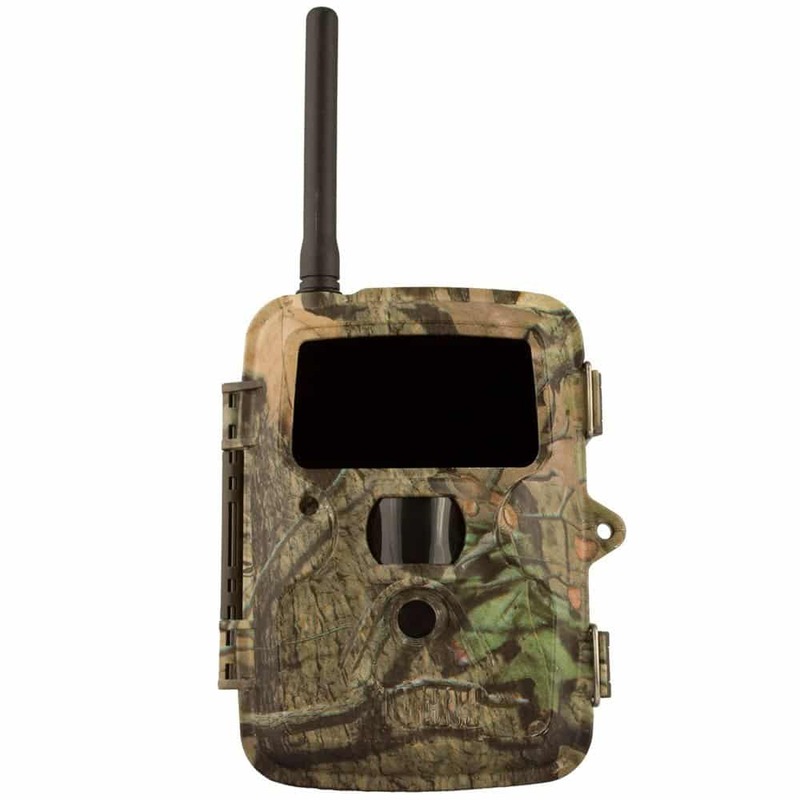 It has a smallish shape (find more small trail cameras here), completely different than the square boxes that make up the most of the market. The oval shape makes for some interesting placement, and it has a unique forest design that makes it stand out more than blend in. Even so it is perfectly fine for home security use and trail hunting-but that is based on its size, not the design. This very compact camera weighs 9.6 ounces so will need to be strapped down tight and secure. A strong wind can send your investment flying, so those hunters that like to live dangerously and not tie down their cameras will be out of a camera. The compact size of 3×4.4×7.8 inches makes it an ideal candidate to put pretty much anywhere you want, even up high. All levels can use the camera, and there is nothing at all complicated about its use. Options are a bit on the sparse side, and the few that are there are easy to understand even for new users. This is probably the easiest to use camera on the market, and it doesn’t do anything really too fancy other than remain compact and light. Durability is not that good, but it isn’t bad. This is one camera that wasn’t meant for the bad weather or elements. It won’t crack under pressure, yet it won’t take good photos during it either. Severe weather will render the camera all but useless until things calm down. As a smaller model it wasn’t meant to take a beating, and a lot of nicks and bruises are to be expected. With video in the 720p range at 1280×720, buyers will get great video from this small camera. The video won’t blow you away and is just a plus to what else it offers. Photos are another win for the model, and if you’re willing to spring for an extra piece the photos are even better. Night time viewing is underappreciated with it, and it does a nice job of photos at night. Stellar would be one word to describe the battery usage, which is to be expected of the smaller cameras in the market. Only 8AA batteries will power the camera for months at a time, depending solely on the settings you have it taking pictures and videos at. More frequent uses will have the batteries getting drained more than normal, so it is going to vary user to user. One button setup is a breeze, letting you set it and forget it. A huge 2.5 inch LCD is embedded in the unit for camera setup and viewing. The feature is so great that you may end up viewing your entire collection on the screen rather than transferring it to a bigger screen. Included GameFinder software is perfect for researching your media and manipulating it. Up to 32GB SD cards are supported with this model. If you want to increase the power of the unit, buying the optional add-on zoom lens is very good for prolonging the usefulness of the camera. For the amount of money it would have been nice if they included the add-on zoom lens with the purchase. As a compact camera it needs a great case, which is completely missing from this model. It can’t take much abuse and has below average protection from the start. There aren’t a lot of options for customizing so it will frustrate intermediate and advanced users. This camera was aimed at beginners, but due to the lack of quality compact cameras for intermediate and advanced users, it becomes a necessary option. Price may be a bit too high for a camera that has this few amount of features. Buyers of the original Plot Watcher have complimented the amount of effort put into this pro version, saving it is a vast improvement over the original. Having something this compact is perfect for what they want it for, and all without the complicated tutorials or more advanced cameras. They cite improved battery life and enhanced use out of larger SD cards as another merit for owning the pro version. The biggest takeaway from the reviews is that their favorite feature is the one touch setup out of the box. It is the quickest camera to set up from that point, and is a frustration free process. The small camera market has value automatically since it can sometimes turn into a niche market. There are plenty of small cameras but not a lot of them can output decent pictures and 720p. The only thing that seems to be missing from these smaller cameras is decent protection, so gauging the value of this model is going to be specific to how well it is taken care of. The appeal on this model may be short lived since it isn’t as futureproof as other small cameras. That is likely to change if the small camera market comes to a complete stop, but that is highly unlikely. In order to get a better idea of the appeal, look at cameras of this size that are half the price with the same specs and then look at the few in this category that are the same price. The appeal is thin because the camera is a bit overpriced even for its own category. There is no rarity worth speaking of with this model, it should be readily available when you need it. This is all assuming that the small camera market will continue to grow and evolve. But this is one camera you don’t have to worry about being hard to find, even in the next couple of years it is out. And this is the dilemma, since for the same price you can get the Bushnell 14MP Trophy Cam HD Aggressor No Glow Trail Camera. This is a superior camera in every way, from pictures to video and right down to the options and indestructible case. The only thing it is missing is the compact size and ease of use that the Plotwatcher Pro provides. If the customer wants to put in a little more effort into their using the product, then the Plotwatcher pro becomes obsolete very soon. There are better options out there for the money, as this model could use a serious price drop. There are too many great cameras from better companies in the same price range that can do a lot more. The only way this is even an option is for the absolute beginner that just wants to set it and forget it. Small cameras have a long way to go before they can play with the big boys. So consider the Plotwatcher Pro a backup option at best if you’re looking for a trail hunting camera or home security.